At the beginning of the surgery, the surgical team must be prepared for the possibility that an emergent open conversion may be necessary at any point during the procedure. Therefore, a general laparotomy set with vascular clamps must be available during the entire operation. Complications associated with laparoscopic radical nephrectomy may be divided into three categories: access related, intraoperative, and postoperative. 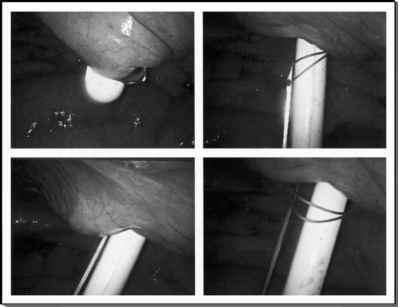 As with any surgical technique, laparoscopic radical nephrectomy is associated with a significant learning curve. In a multi-institutional review involving 185 patients, it was noted that 71% of complications occurred during the initial 20 cases at each institution (35). The rate of major complications following laparoscopic nephrectomy has ranged from 3.3% to 15% (Table 4) (12,16,18,21,36-39). Recommendations to minimize the risk of tumor seeding and spillage during the morcellation process. ■ Only a LapSac should be used, for intra-abdominal morcellation. ■ Morcellation should not be used if the patient has ascites. ■ The surgical team must be vigilant in monitoring the pneumoperitoneum and LapSac during morcellation. Leakage from the sack should prompt immediate enlargement of the incision and intact removal. ■ The neck of the sack should be triply draped. ■ After morcellation, the surgeon and the assistant should change gloves and gowns and remove the three drapes that came into contact with the neck of the sack. ■ The site of morcellation can be swabbed with Betadine after removal of the LapSac. cCook Urological Inc., Spencer, IN. performed emergently in five and electively in eight patients. Postoperatively, the authors noted one case each of a respiratory distress requiring an endotracheal intubation and a gastrointestinal bleeding secondary to an inflamed duodenal ulcer. It has been noted that patients undergoing laparoscopic cytoreductive surgery for renal cell carcinoma were treated nearly 30 days earlier than patients who had traditional open procedures. To date, a subhepatic thrombus with cavotomy has not been done laparo-scopically. It is likely only a matter of time before this is accomplished, as laparoscopic radical nephrectomy with level II vena caval thrombectomy has been reported in an experimental porcine model.